If you’re willing to dedicate yourself to cryptocurrency mining, the chances are that you are going to want to join a mining pool. This is simply how mining is done these days, but there are many pools you can sign up with, so some kind of research is in order if you want to make the right choice. That’s where we come in with articles like this one. Our Nanopool review will show you absolutely everything you need to know about this (fairly popular) business venture anyone can join. Be advised, though, you cannot mine Bitcoin here. What can you do, then? Quite a lot actually, and we are going to show it to you all in the following few paragraphs. Read on! Let’s first take a look at the selection of coins you can mine if you join this pool. Like we already said, Bitcoin is not in the mix, but there are seven other cryptocurrencies you can choose from. These are: Ethereum, Ethereum Classic, SiaCoin, Monero, ZCash, Pascal and Electroneum. The latter is the latest addition to the mix, which has caused quite an uproar in the mining community because there aren’t that many major pools with this particular cryptocurrency in their offer. Nanopool Electroneum mining only became available in December 2017, so it’s still fairly new, but already close to 10,000 miners have dedicated their resources to it. Still, this is not what Nanopool is best known for. The reason we called them a major pool is because they are the third largest Ethereum mining pool, with approximately 13.5% of the hashrate belonging to it. We will have more interesting information in the rest of the review, so don’t go anywhere. There is lot to talk about. We will continue this review with a few words about your Nanopool account. Creating one literally could not be any simpler because all you have to do is start mining and you will get it automatically. However, you can also set things up so that the coins you mine go directly to your account on one of the exchanges this pool supports, like Binance, Coinbase, Gemini, Cryptopia and many others. The full list of supported exchanges can be found in the Help tab of the pool’s website. What is important to mention is the fact that, while you can mine if your Nanopool account doesn’t start with 0x, payments are sent solely to that type of account. It is therefore a pretty good idea to have a 0x account from the start, just to avoid any complications. Obviously, Ethereum account is a necessary requirement if you’re looking to mine this particular currency. We will go into that in a much more detailed manner in the next part of this Nanopool review, so stay with us. Like we said earlier, this is the third largest Ethereum mining pool in the world at the moment. If you also want to explore Nanopool Ethereum options, there are some prerequisites you need to fulfil. First of all, you need an Ethereum account because, as you know, you can’t manage any cryptocurrency without a corresponding account. Furthermore, you will need a GPU with at least 4GB of memory and a 15.12 AMD driver. The algorithm used is DaggerHashimoto, while the lowest hashrate you should aim for is 5 Mh/s. You will also need a miner, but that can be easily downloaded from the pool’s website. As a matter of fact, the website offers many very useful things you can download to your computer in order to improve your performance, so we recommend investing some time into checking things out thoroughly. At the moment of writing this article, Nanopool Ethereum community numbers almost 93,000 miners, with their total hashrate amounting to 35,700 Gh/s. As for the payouts, they are made a few times a day, but without any payout commissions. And although default Nanopool payout is set to 0.2 ETH, it can range between 0.05 and 20 ETH every time. Moving on with this Nanopool review, we will take a quick look at the Ethereum Classic mining pool you can find here. Given that we’re talking about a fork from the cryptocurrency mentioned in the previous paragraph, it is no big surprise that most numbers and requirements are very much the same. You need the same hardware, payouts are done in pretty much the same way, miners and third-party software can also be accessed easily etc. What we forgot to mention earlier is that the mining difficulty is set to 5 billion, and this applies to both cases. The only difference between the two is the fact that default Nanopool payout in this case is one ETC, but it can range from 0.1 to 100 ETC. There are about 5000 Nanopool Ethereum Classic miners at the moment, with a combined hashrate of just under 1,700 Gh/s. This vividly depicts the difference between the two blockchains, but in all honesty, Ethereum Classic is not the main reason you’d want to join this pool. What could be a reason for that is Electroneum, so stay with our Nanopool review to see how you can mine that particular cryptocurrency here. Electroneum was released in November 2017, and less than a month later Nanopool already had it as a standard part of its offer. This was certainly big news in the cryptocurrency mining community, so the number of miners rose rapidly. Today, there are over 9000 of them, with the pool hashrate standing at approximately 108,000 kh/s. However, these two numbers are getting bigger every day, so you may want to hurry if you want to start mining this particular cryptocurrency. As you can see, the hashrate is still fairly low, so Nanopool Electroneum mining can be done even with a CPU if you don’t have a GPU, which makes it quite accessible for now. AMD, NVIDIA and CPU miners can all be found on the website, but the algorithm used in this case is CryptoNight. Be aware that there is a Nanopool Electroneum payout commission you will have to pay, but it’s 0.01 ETN at the moment. However, this number is dynamic and always shown as a maximum value, so keep that in mind. Given that payouts range from 100 to 100,000 ETN, the commission really isn’t something you need to worry about right now. If this isn’t your cup of tea, though, the other cryptocurrency mining options offered here can help you out. A very interesting one is coming up in our Nanopool review, so just keep reading! Apart from Ethereum, Nanopool Zcash mining community is also among the most numerous ones in the world. 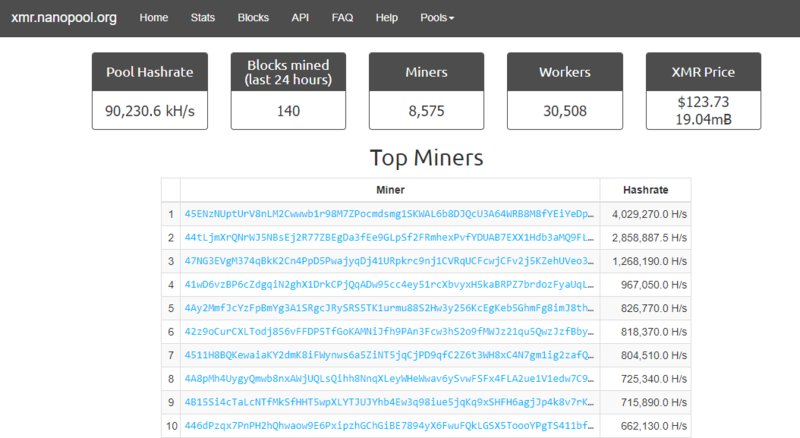 There are more than 18,500 miners (just over 35,000 workers) there at this moment, and the pool hashrate is about 53,600 KSol/s, with the Equihash algorithm being in charge of things here. You don’t have to worry about any Nanopool Zcash payout commissions here, while the payouts themselves go from 0.01 (the default value) to 10 ZEC. You can get paid several times a day and, of course, everything can be delivered to your Zcash wallet directly, no matter on which exchange you have it. Now, we have to mention once again that you can find everything you need on the website, be it mining clients, miners or apps designed to help you out. You can even get some power from NiceHash if you want – this pool actually endorses it. Just remember that any attempt at Nanopool Zcash mining means you have to have a GPU and at least Windows 7 as your operating system, whereas the mining difficulty is static at 25600. 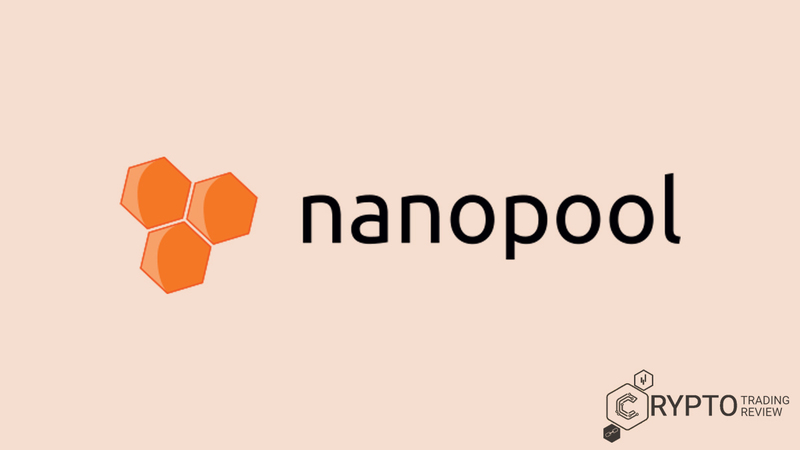 As we have already mentioned in this article, there are more cryptocurrencies you can mine, so allow us to give you a short overview of the remaining ones in our Nanopool review. Read on! There are three more cryptocurrencies you can mine through Nanopool: Monero, Siacoin and Pascal. Everything we said for other currencies in the previous paragraphs also applies here – in each case, you will be mining in an established pool and be supported in an excellent manner. There are some small commissions to take into consideration, but nothing that is out of the ordinary. It should also be mentioned that all of them have static mining difficulties and that you can easily mine each cryptocurrency to its respective wallet on any exchange. Whatever you need to learn can be found on the help page of each of the pools, so we can say that no matter what you want to mine you will get the same high level of service. This is a globally recognized mining pool, after all. Of the three, Nanopool Siacoin has the biggest number of miners working on it, almost nine thousand of them, while Monero has more than seven thousand and Pascal more than six. 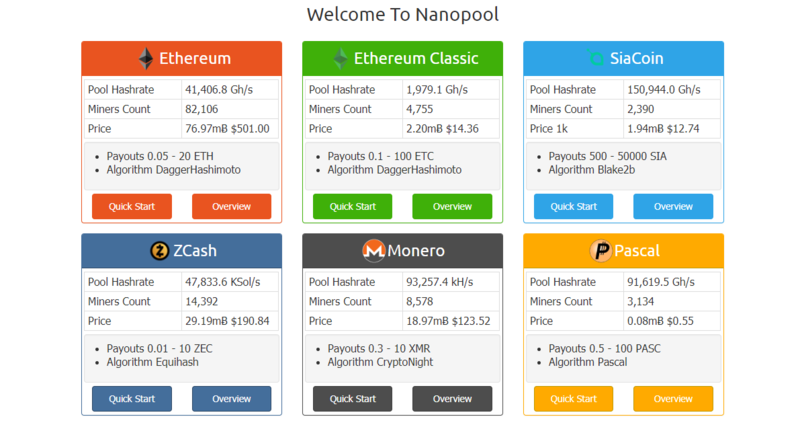 In each case, Nanopool is among the biggest pools, so you can’t go wrong. But don’t think this is all just numbers and mining on your computer. There is also a great app for your mobile devices that can help you out. Learn all about it in the next paragraph! In order for this Nanopool review to be useful to you as much as possible, we have to point out that there is also a very interesting app you can download. It is called Nanopool Mining Monitor and what it does is that it allows you to keep an eye on your workers all the time. You can monitor some pretty vital data this way, such as your revenue expressed in USD, bitcoin or coins per day, week or month, various hashrates, payment transactions and everything concerning your workers. Another very useful feature of Nanopool Mining Monitor is that you’re not limited to one account. You can easily switch between all cryptocurrencies on offer here just by inputting the address of your wallet. For example, you go and check what’s the situation with your Nanopool Ethereum account, get the information you need, and then simply switch to Zcash with a few taps. We should also mention that the developers are constantly working on this app, so if you think you have something they should improve, just contact them and give them your opinion. And if you don’t trust us, just take a look at what other people say. 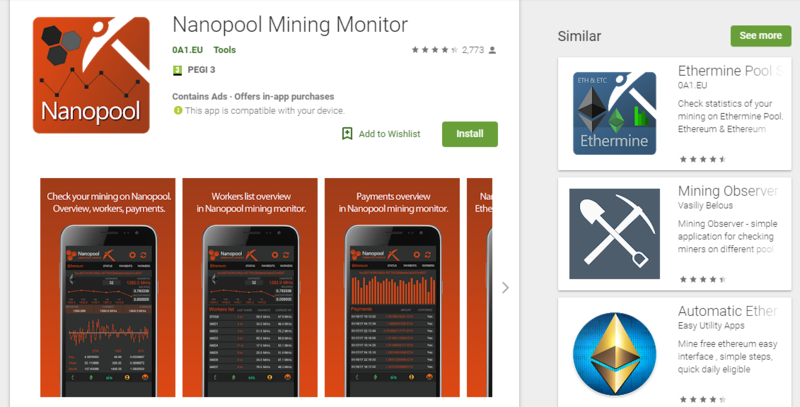 Nanopool Mining Monitor is an excellent product across the board, and many miners have found it to be extremely helpful. One more thing we need to discuss before we go! You may have noticed that this Nanopool review has not discussed fees yet. We wanted to leave that for the very end and focus on the features that make this mining pool stand out before that. Now, however, it’s time to take a look at that part of the offer, too. Nanopool fee will be 2% for three cryptocurrencies: Electroneum, SiaCoin and Pascal. For the other four, the fee stands at 1%. Compared to other mining pools out there, this is right about in the middle – nothing spectacularly low, but nothing too high, either. Another very important aspect of doing business here is the fact that all transfers to you are done in a PPLNS manner. However, this N is pretty important and varies depending in the coin your mining. For Nanopool Ethereum this encompasses all shares submitted in the last 20 minutes, whereas in the case of Nanopool Zcash mining this time period extends to full three hours. Do a bit of research for the coin that interests you, just to be sure you know what to expect. With that, we believe we can bring this analysis to a close. We hope you’ve found what you were looking for, but if you need a quick reminder of what this pool has to offer, don’t worry – it’s just below. All in all, there is a lot to explore if you decide to go with Nanopool. Bitcoin is not on the menu here, but there are still some very interesting choices you can make. After all, this is the third biggest Ethereum mining pool in the world. Apart from that, they also offer Electroneum mining, which is quite interesting because this cryptocurrency was released fairly recently and Nanopool was the first big mining pool to endorse it. Apart from these two, there are five more cryptocurrencies you can mine, so the selection is quite satisfactory. As for the technicalities, we have to say that Nanopool fees are usually between one and two percent, whereas Nanopool payout commissions do not exist. On the website, you can also find loads of downloadable materials that can help you improve, including miners and third-party apps and software solutions. There is no need to waste any time on account creation because everything is done automatically as soon as you start mining. The whole interface here is pretty basic, maybe even slightly too basic, so if you’re encountering a pool like this for the first time it may take a while for everything to sink in. However, if you have some experience, you’ll love what you get here. In short, mining here is a great solution, provided that you’re not looking to mine Bitcoin of course, especially if you’re not willing to invest in an ASIC rig. Link up with Nanopool today to begin your brand-new career!